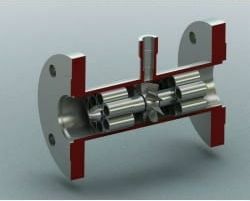 The basic construction of turbine flow meters includes a bladed turbine rotor which is axially suspended in the pipe. As the fluid flows through the pipe, it causes the rotor to spin on its axis at a speed which is proportional to the velocity of the fluid. The passage of each rotor is sensed by the turbine meter using gears, photoelectric cell or magnetic pickup installed on the outside of the flow tube or the meter body, adjacent to the perimeter of the rotor. The turbine meter is a popular displacement flow measuring device, which can be used in a wide range of industries for both liquids and gases. Turbine flow meters have the ability to measure wide flow ranges with good accuracy and at an economic price; their application is restricted only by the fact that they must be used with clean, non-corrosive fluids. ​Turbine meters operate most effectively in applications with steady, high-speed flows. View our range of Turbine Flow Meters here. Use our product comparison table to guide you in selecting the right product for your needs.